The American Museum of Natural History in New York and the Museum of Ethnograhy in Hanoi with support from the Ford Foundation and a great deal of diplomatic effort, created a beautiful exhibit that featured the various ethnic groups of Vietnam. The exhibit opened at the AMNH in New York City before going to its permanent home in Hanoi. It was a working trip for my wife Maritza who was there in her role as the AMNH Director of Education. I am in awe of her ability to have conducted such a dynamic, positive, three week long learning experience with her Vietnamese students. 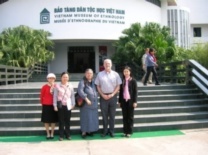 I learned enough Vietnamese to get around, photo documented events, and kept a number of museum things running smoothly. I was a good ambassador and tried to mend a few fences between the USA and the older generation and their children. 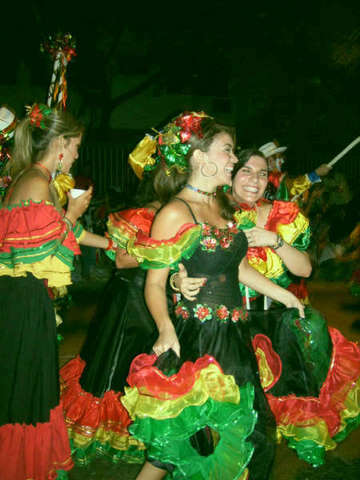 My introduction to Barranquilla Colombia was during the Carnival season of 1970 the first stop of an "epic" three month hitch hiking trek through South America that, as they say, forever changed my life. A count of the in-laws and Colombian "cousins" would indicate that I am now about 85% Colombian. To make a long story short, I bused and trucked down the Andes, Colombia to Southern Chile and then up through Argentina and Brazil. The on the top of the train ride from Cuzco Peru to Machu Pichu, through those deep roaring Urubamba river gorges, and the three days messing around in the Incan ruins were deeply satisfying. In those days you could nudge the llamas aside, hang your hammock in one of the old roofless buildings and let the mountains/clouds envelope you for as long as you felt like it. Go to Bergen County NJ home price lists: for number of houses for sale, lowest home price, average home price and highest home price for each town in Bergen County. Since 1990: helping buyers and sellers of Northern NJ real estate make well informed property investment decisions!